Killarney is a vibrant little town surrounded by breathtaking and ever-changing beautiful landscapes. The three main lakes of Killarney occupy a broad valley stretching south between the mountains. The three lakes and the mountains that surround them are all within the Killarney National Park. The Lower Lake is nearest to the town, it is studded with islands and has Muckross Abbey and Ross Castle on its eastern shore. The Ring of Kerry - A MUST!! The Ring of Kerry is an unspoiled region of Ireland that has attracted visitors for hundreds of years. Its spectacular beauty is beyond question and it is a natural centre for outdoor pursuits including golf, watersports, cycling, walking, riding and the very best fishing for salmon & trout. The Ring of Kerry has some of the finest beaches in Europe. Around the Ring of Kerry you can see Iron Age Forts & Ogham Stones, Old Monasteries and a landscape carved out of rock by the last Ice Age 10,000 years ago. 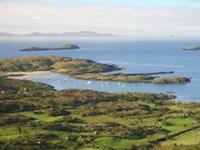 The Ring of Kerry Tour - Available daily. You will be picked up in the morning from your local hotel. The excursion offers great panoramic views, a few historical facts and funny stories of the area. Situated in Killarney National Park, Muckross House and Gardens are among the most popular of Irish visitor attractions. Muckross Traditional Farms are situated adjacent to Muckross House. These working farms recreate and portray the traditional farming methods, and way of life, of a typical local, rural community of the 1930s. There is no other landscape in western Europe with the density and variety of archaeological monuments as the Dingle Peninsula. Because of the peninsula's remote location, and lack of specialized agriculture, there is a remarkable preservation of over 2,000 monuments. Spectacular mountains, long sandy beaches and the staggering splinter-slatted mass of rocks that defines the extraordinary coast at Slea Head. The Dingle Peninsula is also associated with the film industry. Ryan's Daughter was filmed here, as were parts of Far and Away, which starred Tom Cruise. A 15th Century Castle, which has been restored and has guided tours located on the shores of Lough Lein. A beautiful glacial valley in the Macgillacuddy Reeks mountain range, which dominate the skyline of Killarney. 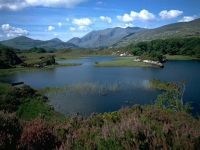 You can tour the Gap of Dunloe, by horseback or pony and trap through the Gap, and then by boat across the Killarney lake to Ross Castle. Jaunting Car rides available around the Lakes of Killarney Boat rides available on the Lakes of Killarney Fishing: There is an abundance of fishing in the area, brown trout and salmon are the specialty. Walking Trails: There are many designated walking trails throughout the National Park.